Or pop this one in your basket (the bestselling 4500 litre will drop into your basket). Pond size to 1000 gallons (4500 Litres) 4500 Litre Set £129.99Pond size to 1500 gallons (7000 Litres) 7000 Litre Set £169.99Pond size to 2000 gallons (9000 Litres) 9000 Litre Set £199.99Pond size to 2640 gallons (12000 Litres) 12000 Litre Set £229.99If you are looking for a complete pond system then these sets could be perfect for your project. 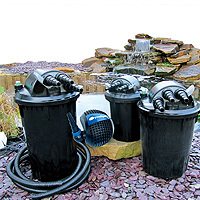 We custom build these sets and all include a solids-handling pond pump and easyclean pressurised pond filter. We even include hose and clips so you have everything you need in one box. 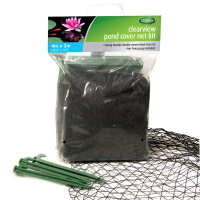 These Clearview nets from Blagdon are highly effective at protecting your pond yet difficult to see once in position. They protect your pond from objects such as fallen leaves dropping into your pond. Also cover nets act as an effective pest deterrent. Graceful contemporary waterfall. Enjoy the sight and sound of the water as it cascades from bowl to bowl before entering your pond. 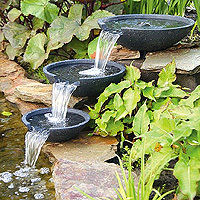 This attractive water feature set includes three bowls, pump, hose and fittings. Can also be used as a ‘stand-alone’ water feature (you would need to build some sort of reservoir to achieve this – not included). However, many of our customers are put off by the premium price. 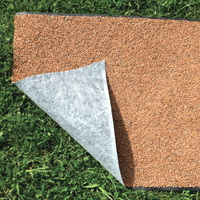 New for this year PondXpert stone pond liner is up to 33% cheaper than other alternatives in the market. Apart from the classic gold colour you can have white or this great TERRACOTTA finish! This new pond vac has the highest specification of all budget vacuums available in the market today. As well as standard features such as a 2m max. operating depth and a 2m length outlet hose it also boasts additional power (1600 watts) and a high-capacity chamber (35 litres). It also comes supplied with 4 wheels allowing easy manoeuvrability and transportation. 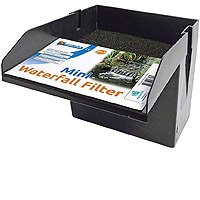 Use the dirt collecting Vac Basket to catch solid particles – this allows you to release the filtered water back into the pond. 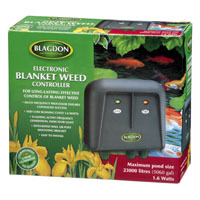 For long-lasting effective control of blanket weed. Suitable for all ponds up to 23,000 litres (5060 gallons).This quick and easy to install machine emits varying radio frequencies to disrupt calcium ions in the water – this causes the blanket weed’s cells to break up. 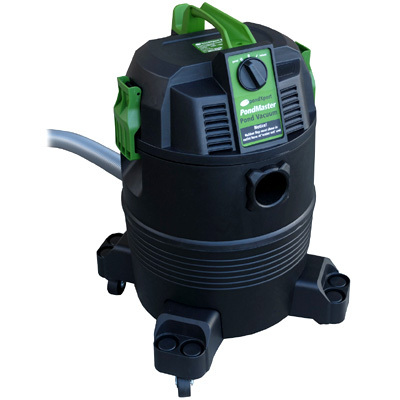 Make life easier for yourself with this superb pond pump and filter set. This pressurised filtration system is based around the brand new SpinClean Auto 40000 Pond Filter. 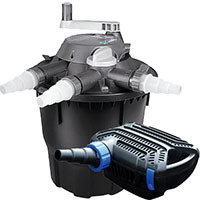 This pond filter employs a brand new automatic way of cleaning the filter sponges. An internal ‘paddle’ scrubs the pond sponges during a three minute cleaning cycle – you can then simply was away the dirty water via the dedicated waste outlet. No mess – no fuss! 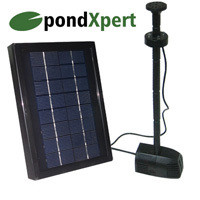 The filtration system is powered by the mighty PondXpert FreeFlow 19000 Pond Pump – this pump is designed to run 24/7 pushing large particles of dirt up to 8mm in size up to the pond filter. Despite the immense power this pond pump has an ‘eco’ motor requiring just 200 watts. The pond pump is ‘easy clean’ too as you can simply lcick open the filter cage without tools making periodic maintenance a doddle. All in all we think this pump and filter set offers the best value for money we have seen – buy one today before our introductory pricing expires. 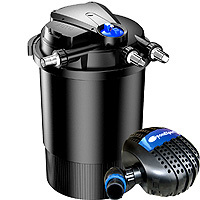 This pump and filter set matches extraordinary performance with a low price tag. With the Bioforce Revolution 14000 we now finally have a pressure filter good enough for koi/mixed fisheries. A huge volume of 16,000 litres can be handled by this set or 8000 litres if you are keeping koi. The prime breakthrough with this filter is how you clean it – simply turn the external handle and an internal paddle effectively cleans the sponges. In this set you also receive the PondXpert FreeFlow Pond Pump boasting an 8mm solids handling capability and 8000LPH hour flow rate but only 70w running costs.